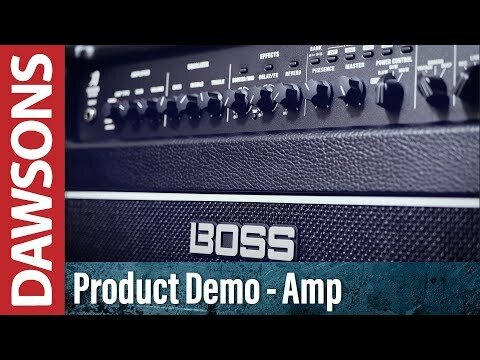 The BOSS KATANA-Artist Guitar Amplifier Combo is an outstanding 100-watt combo that is perfect for taking out on the road. Adhering to the KATANA style and tones that have won so many over in such a short space of time, the KATANA-Artist is a heady partnership of power and precision. For those who like to rock, this is the perfect amp for you. The KATANA-Artist features a semi-closed cabinet design, which guarantees a solid, road-ready build quality that produces tight and articulate tones. The response can be acutely attenuated via the dedicated Cabinet Resonance control, which allows you to dictate how the amp's output section and custom Waza 12-speaker interact. BOSS' engineers have worked tirelessly to fine tune everything for a system that communicates harmoniously. The KATANA-Artist is fitted with a custom Waza 12-inch speaker, which produces the sought-after tones that became synonymous with British speaker stacks that have dominated stages since the 1960s. From carefully gathered components to intricately woven design, the Waza speaker is the ultimate rock speaker to accompany the ultimate rock amp. Rather than being a one-dimensional affair, the KATANA-Artist boasts five selectable amp characters that offer everything from cool vintage tones to brutal high gain assaults. The Clean settings is a bright and glassy as you could hope for, whilst Crunch delivers a delightfully pleasing bite. Lead is perfect for nailing anything from fat blues to shred-happy sweeps. The Brown setting is a high-gain output for rockers who want raw power, whilst Acoustic is perfect for giving your electro-acoustic the grace and clarity it deserves. Whether you're in the studio, on the stage, or on the street, BOSS have equipped the KATANA-Artist with a range of effects and amp types to choose from. However, by connecting to BOSS' Tone Studio editor software, you can choose from 58 customizable BOSS effects with a plethora of routing configurations. There are eight Tone Setting memories for storing and recalling amp and FX settings at will. With front panel control or accessibility via an optional external footswitch for hands-free control, the memories are perfect for planning out dynamic performances. When you're playing a gig, an easy to use interface is a must. Across the front panel of the KATANA-Artist you'll find controls for gain, presence, and a three-band tone stack with essential FX parameters. There is a Power Control that allows you to set the power to Standby, 0.5W, 50W, or 100W, allowing you to get that cranked-up tone at bedroom, small venue, and large venue levels. The KATANA-Artist is also equipped with line, USB, and headphones/recording outputs with cabinet simulation, which allows you to output a simulated mic'd up amp sound to a PA system, your DAW of choice, or headphones for practising. The control panel's Air Feel knob allows the spatial characteristics of the cab sim to be changed to suit your performance. As noted above, there KATANA-Artist benefits from connection to BOSS' Tone Central editor software, which enables sounds and effects to be customized to create personalised setups. Whether you're performing a gig, practising, jamming with friends, or recording you next album, the setup can be adapted to suit your circumstances.